Ever since we started Vielgut, we have always told our fans that we don’t believe in Black Friday, Glamour Day and what’s more. What we believe in is great service every day of the year. And a nice collection of fine and honest brands. So we don’t believe in trends and fast fashion. But we do love to see our fans back after four or five years still wearing their beautiful dry denims or favorite sweater. And we don’t believe in talking people into buying more at lower prices. We believe in quality all over, so also for the people who make our lovely clothes. Fair trade and ‘care for the world’, that’s what we like to support. And let’s be honest about it, at Vielgut we still don’t achieve 100%. But we think every small step forward makes a difference. Therefore we are not taking the short cut, but want to go for the long run. And just because all of that, Black Friday, a ‘concept’ which flew in from the US, is one of those days which makes us feel a bit sad. At the same time we noticed that some of our fine brands and colleagues feel the same about this. And also a lot of our fans don’t believe in fast fashion anymore. They are, on this ‘special’ Friday, also making a statement against the foolishness of over-consuming. So we decided to turn Black Friday in Feelgood Friday. 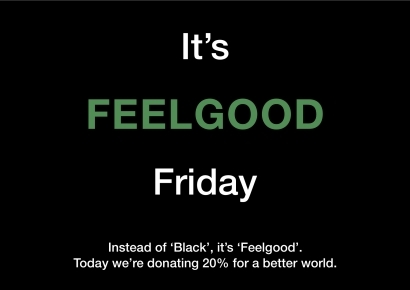 We want to give more meaning to this day and therefore donate 20% of our Feelgood Friday income to something more meaningful. We didn’t pick our ‘charity’ yet, because we love to hear what you all think would be a meaningful organization for Vielgut to donate our 20% of Feelgood Friday. And of course, you’re more than welcome to drop in. For a chat, for a coffee and even for shopping some slow fashion. And just for this Feelgood Friday, our interpretation of Black Friday, every purchase is worth 20% in cash for a better and nicer world.